I love Pinterest, really I do, but it can be a real headache sometimes because people want you to recreate extravagant cakes, cookies, or whatever. This really was a fun project though. 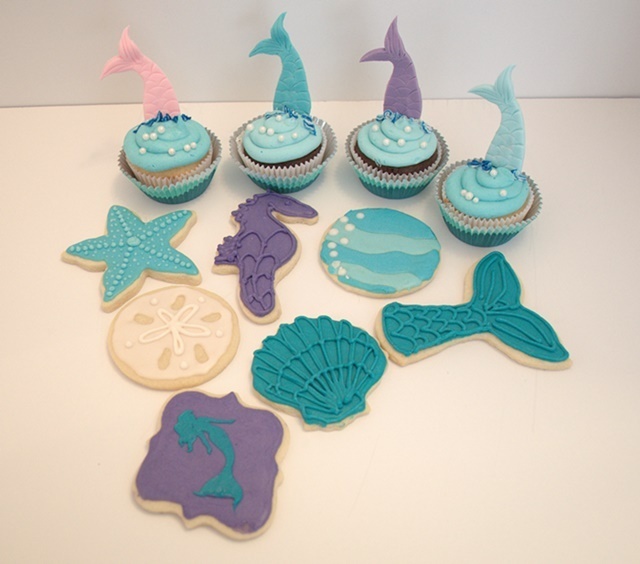 Cupcakes with fondant mermaid tails and under the sea character cookies. 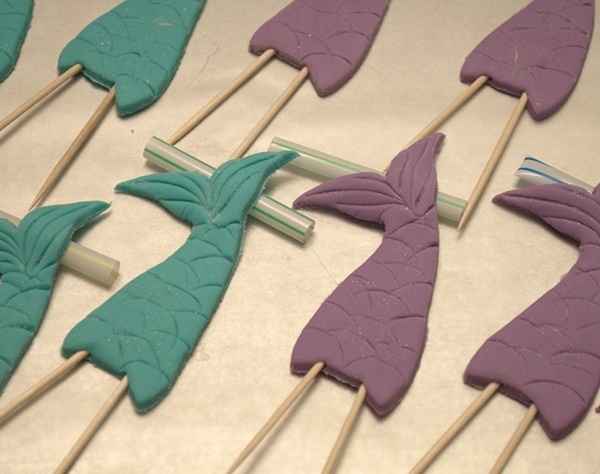 I started making the mermaid tails for the cupcakes several days ahead using a mixture of fondant and gum paste and I had found a small 3″ cookie cutter that was perfect. Saved me from having to use a paper or cardboard template and using an exacto knife to cut out the tail. Saved tons of time. While the fondant was still soft I gave the tail a slight curve to it and then used small pieces of drinking straws to give the fin a bit more movement. The round end of a decorating tip was perfect to imprint scales on the tail. The hardest part was trying to insert the toothpicks in the tail without having them poke out the back or tear up the tails. They really were needed to keep the tails standing in the cupcakes. I also lightly brushed some luster dust over the tails to give them a bit of shimmer. 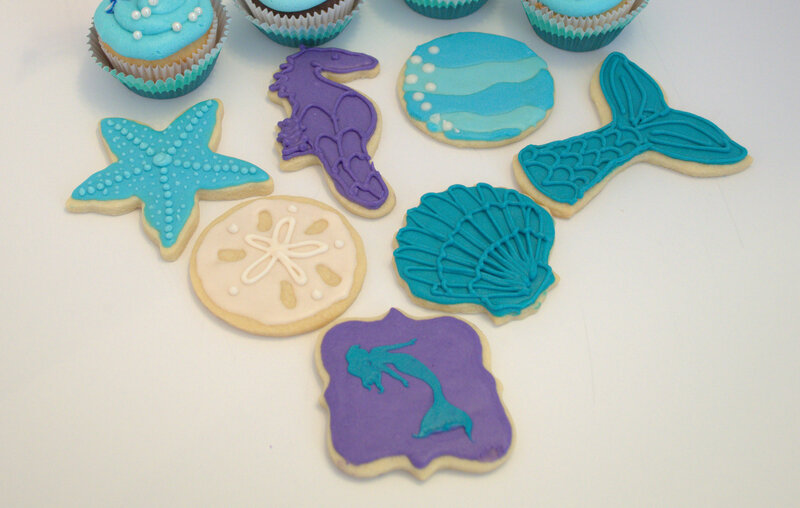 Blue buttercream frosting for the water with contrasting blue and white to emulate the splash as if a mermaid just dove into the waves. To finish it off I found cute little cupcake papers that almost look like waves. The cupcakes were vanilla with strawberry filling and chocolate with chocolate whipping cream filling. 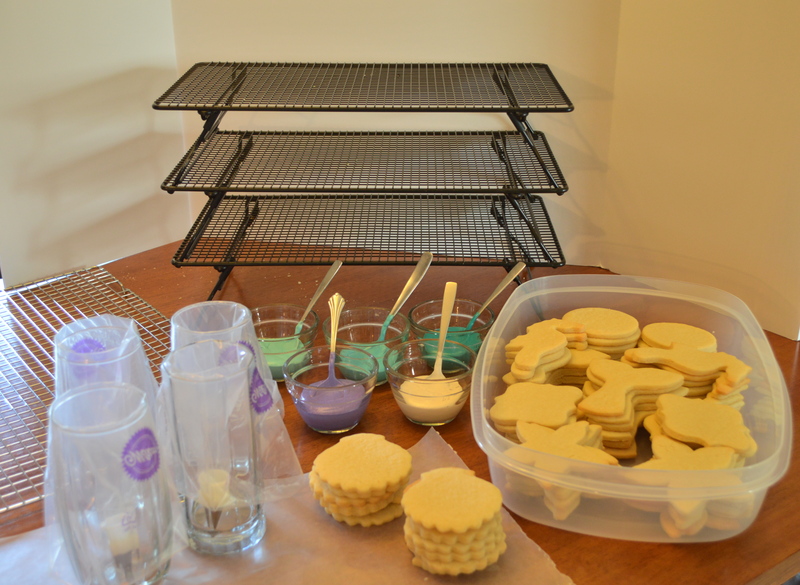 Cookie decorating station ready. My best friend is my stacking cooling racks. With such a small work space they are so handy. 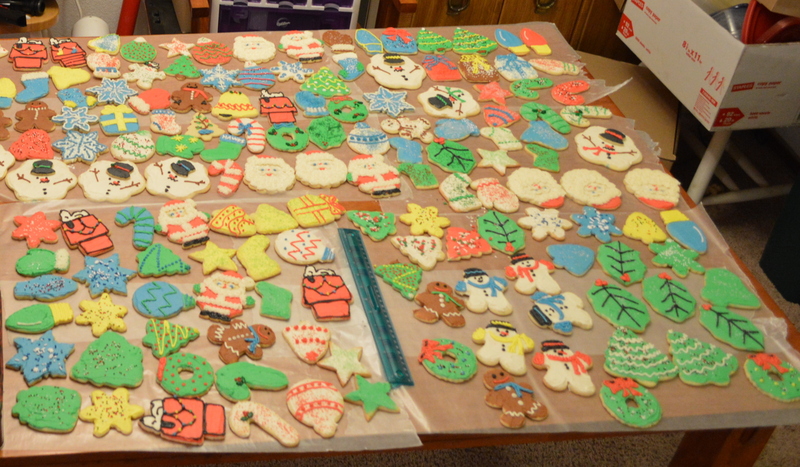 Decorating the cookies was going to be my biggest challenge. 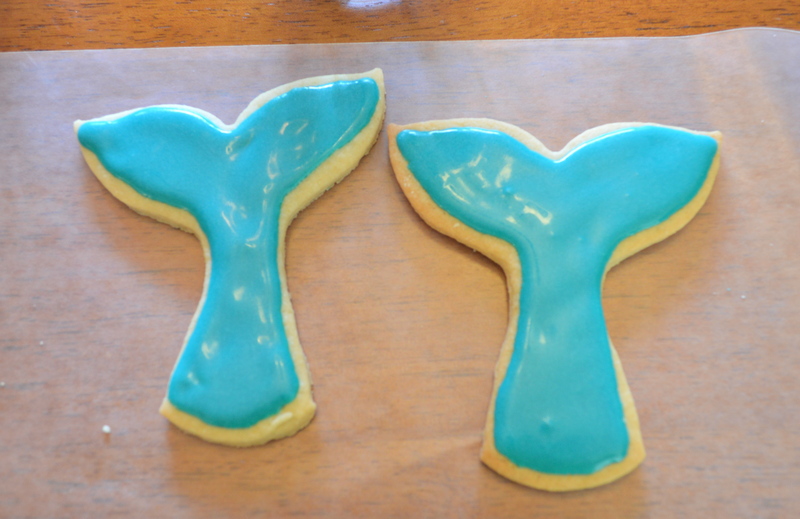 I usually use straight buttercream which doesn’t allow for fine detailing, but the cookies needed royal icing. I hate using royal icing for cookies. It does make for a beautiful cookie but it doesn’t have a good taste no matter how much flavoring you use and it dries as hard as a rock which I think ruins the taste of the sugar cookie. I found a really good recipe for a combination of royal icing and buttercream at Karen’s Cooking Blog. It gives you the smooth finish of royal icing and hardens enough to stack without smooshing the frosting. But when you bite into the cookie it is just as soft as buttercream and tastes just as good. First outline the cookie to keep the frosting from dripping down the sides of the cookie. I piped some frosting in the center and then used a toothpick to spread it out evenly. 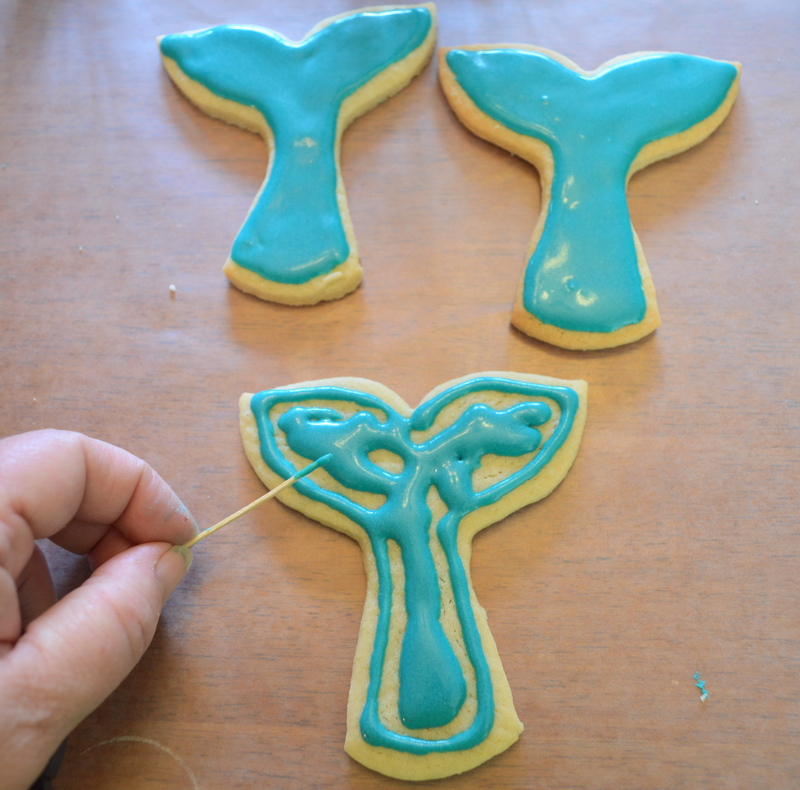 Gently tap on the table to ensure everything settles evenly and let dry for about a few hours before piping on the details. I had to experiment a bit before I found just the right consistency for the detail piping but after adding more powdered sugar a little at a time I finally got it right. My only issue with the details is I wish I had used a little lighter shade and not the same as the base frosting so the details stood out a little better. That’s what I did for the starfish and I love how that turned out. I found a great tutorial for the sand dollar at Sweet Sugarbelle and found the perfect stencil on Amazon for the embossed mermaid. I thought I might have an issue with the frosting not giving me nice clean lines but it worked perfectly. All in all I’m pretty satisfied with how everything turned out and learned a few new things along the way. I’ve almost decided that I am going to decorate my Christmas cookies with this frosting this year instead of my usual buttercream, whatcha think?